Pregn ancy Yoga or Antenatal/Prenatal Yoga is the yoga and the practices done by a lady after conceiving, while carrying her baby. 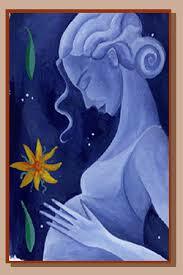 Apart from these benefits, Yoga practiced during pregnancy is also known as ‘Garbha-Samskara’. ‘Garbha’ means the foetus in the womb and ‘Samskara’ means impression or educating the mind. Yoga Nidra, the psychic sleep, is a beautiful technique of meditational relaxation. Yoga Nidra allows to take Sankalpa (Resolve) which is a seed deep buried in the sub-conscious soil of human mind. When the mother takes a positive Sankalpa every day during Yoga Nidra, the unborn baby grasp the Sankalpa subtly and is born with it. The Sankalpa taken during the practice of Yoga Nidra allows the baby to develop those qualities which will improve the quality of its body, thoughts, deeds and LIFE. The three mantras given by our Guru, calm down mental activities immediately changing the attitude, reducing the stress and anxiety, thus promoting physical and mental wellbeing of mother and baby throughout the pregnancy span and post-delivery. Those three mantras are Mahamritunjaya Mantra, Gayatri Mantra and Durgaadvaatrinshannaamamaala (32 names of Devi Durga). A special bond between mother and child develops immensely through Yoga, as it becomes a silent language of communication for both. TRATAKA, a meditation practice of cleansing of thoughts and good concentration imparts high concentration to the baby in the womb. Allows the mother to continue giving the Samskaras to the child, with the help of Sankalpa during Yoga Nidra and Mantra Chantings.